Spend your vacation immersed in the beauty of Norris Lake Springs Dock Resort. This floating house surrounds you with tranquility and relaxation. Wake up to the fog rolling across the water and fish jumping right in front of your gaze. With large open swim area right out front. Relax on the sun chairs on the deck and take a dip at your leisure or read and work beneath the shade of the covered porch. The house has WiFi and land phone line. Pull your boat right up to the house, docked privately making it seamless to load coolers, towels and snacks for a fabulous day on the lake. The large living room boasts a cozy sectional sofa and rocking chair. Large television with smart dvd player and fireplace.The kitchen is a large open area with butcher block island with plenty of seating and counter space. Its fully furnished with any appliance you could ever imagine, including full size appliances and washer and dryer. We strive to make our guests feel right at home. Bedroom #1 sleeps 4 with a queen bed and futon. Bedroom #2 sleeps 3, with a full size bed and overhead twin bunk. Bedroom #3 (master bedroom) sleeps 2 with a queen bed. There are 2 full bathrooms one in the main house and one in the master. The exterior has enough docking for 4 boats. Has an outdoor bar and radio system as well as a dock side gas fireplace. Gas grill, patio dining set, patio conversation set and lounge chairs for sunning are also available. Experience Norris lake as you never have before. This property is accessible by boat only. Boats can be rented at Springs Dock Resort. We are an active family of 5. We enjoy travelling and seeing the world but we keep a couple of special properties close to our heart. Our lake house is truly one of a kind. We worked hard to think of every detail to make folks feel right at home. This property boasts a huge open area right in front of it. 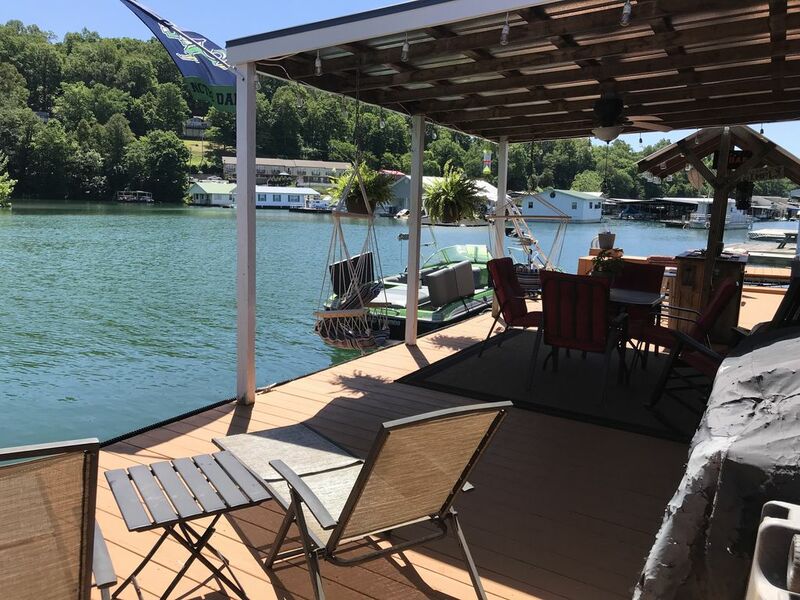 There is no better way to experience Norris Lake than staying right on the water. Cathedral ceilings and the open floor plan makes it extra accommodating for families. The covered porch and custom built propane fire glass fireplace on the dock make for some beautiful nights of rest and relaxation. It was a very relaxing and welcoming. We had a great time. The house was perfect. It was very relaxing and made us feel welcomed. The staff at the marina was really friendly and helpful. Will defiantly stay here again. Ryan was very helpful also with the reservation. The most relaxing weekend getaway! This house was amazing and located in a really great community of people. I booked the stay last minute and the VRBO site wasn't working, but Ryan was so communicative and responsive and helped me get everything set up. Highly recommend this place. Thanks for a great weekend, Ryan! It was everything we hoped it would be. Whether you're laying in the sun or fishing throughout the day, it felt like home coming in to rest and relax. Even tho I didn't get to communicate with Ryan's husband, she was amazing and they were wonderful at responding to any questions. They seem like great people! We already want to go back when fish are biting :) We have recommended the Oasis to a few friends as well. Definitely would stay here again!! !